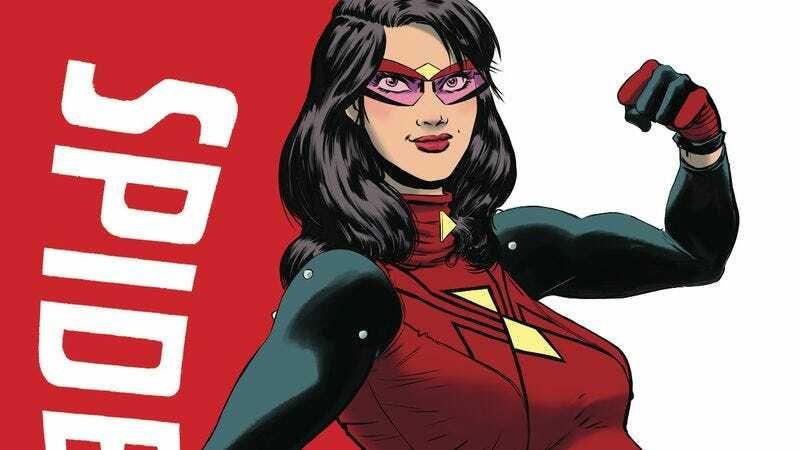 Jessica “Spider-Woman” Drew never wanted kids, a sentiment she makes very clear on the first page of next week’s new Spider-Woman #1, but people change. When Marvel announced that writer Dennis Hopeless and artist Javier Rodriguez’s second volume of the series would feature a pregnant lead, fans of the character were quick to point out that Jessica has never been interested in motherhood in the past, and Hopeless directly addresses those concerns in the script for this first issue. It’s understandable why the development hasn’t been greeted with much enthusiasm, but the strength of Hopeless and Rodriguez’s issues of Spider-Woman’s first volume is a reason to give this creative team the benefit of the doubt as it takes Jessica on a journey she never planned for. After a weak opening arc tying into the Spider-Verse event, Hopeless dramatically reconfigured the series with the help of new artist Rodriguez and inker Alvaro Lopez, embracing a tone heavily inspired by Mark Waid and Chris Samnee’s Daredevil, which Rodriguez colored for years. This preview of Spider-Woman #1 highlights the bold layouts, textured linework, and expressive colors that have elevated this series, and the art team’s work has only become richer in the break between volumes. The hot palette and hectic composition of Porcupine’s battle with a gang of supervillains are a stark contrast to the cooler colors and open layouts when Jessica is the focal point, drawing a sharp visual distinction between the chaos of the crime-fighting life and the more relaxed role Jessica has taken on in her pregnancy. It’s hard to beat up bad guys when you have a giant belly getting in the way, but knowing Jessica’s history, it’s only a matter of time before she’s thrown back into action, whether she wants it or not.